I don’t know. They are sweet. They are cute boys. They win classroom awards like, “Most Conscientious”. These are the only reasons I can think of that the teachers don’t call me when my boys do a project in school and they...just look at the picture. There are reasons I am not a PTO mom, or a scissor mom, (the ones that come to school to cut things out). 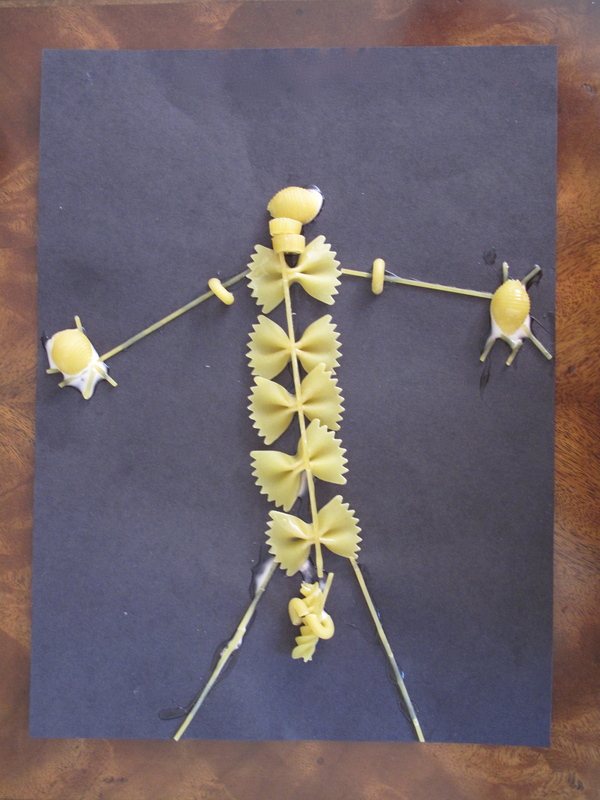 The reasons are because my kids think its funny to make a pasta skeleton and put macaroni testicals and rotinini pee-pee and spaghetti BONE? I asked what the spaghetti was and he said, “That’s the bone in the pee-pee“. I know I clearly have more to worry about, judging from this picture, but…. FOR THE LOVE OF GOD WE HAVE STANDARDS. YOU DAD IS A BONE DOCTOR! HOW CAN YOU NOT KNOW THERE ARE NO BONES IN YOUR PEE-PEE? I take a few deep breaths. I put it into perspective. There are three types of pasta that makes up the noodle guys junk (oh and we know it’s a noodle GUY, right) but the dude has no feet. For all of you with girls I want to remind you that little boys are different. For little boys, that area is a toy that stays with you. To quote one of my kids when they were three, “When can I get one of these BALLS out so I can see what they look like?” Your daughter is putting shoes on her Barbies feet right now and I have an anatomically (in)correct footless pasta dude on my fridge. Please hit the follow button if we made you smile today. I am trying to figure out what to do with my almost month long blog. If you have and comments or suggestions please let me know. Thanks for coming by to read. I am trying to create a place where you can go daily for a quick story that makes you smile, laugh, think, love, cry or cry laughing. A story you can relate to because we are part of some kind of family. A place to go to read after you have read the days news on your mobile and you want to smile and relate. I was always looking for it on my phone while sitting in line at the school drop off/pick up or on the side of my kids practice fields. I had never written anything to share. I have written down these stories for years and I am a total picture geek, (not that I know what I am doing but how I love to scroll through our photos) and I just put them together. Hope you enjoyed. This entry was posted in children, family, humor, life, parenting, photography, school and tagged anatomy, bones, boys, children, crafts, Education, family, funny, God, hilarious, home, humor, joke, kids, laugh, life, Parenting, Pasta, school, smile, Spaghetti, teaching by All that makes you.... Bookmark the permalink. This really made me smile! I am so happy I made school enjoyable for someone. 😉 So, dude, I love your cartoons. I have an idea for another blog I want to do incognito. I need a cartoon head of myself to put over my photos. I think it could be done funny but also realize I will have to modify a head for different poses. What program do you use, if you don’t mind me asking? Then I am going to have to learn to draw. ha ha! I saw your site and was like…this is what is in my head! You are very talented that you can tell a story and illustrate the humor in your head. Yes. You do make my day. I have 7 grandboys. No grandgirls. Thank God. Well thank you for stopping by and commenting! It keeps me writing this stuff down! Oh…..and I have stuff! Ha ha! I wish the kids I teach were this funny. Notwithstanding the lack of orthopedic expertise, this is a keeper. Oh, I snapped a picture immediately for fear of something happening to it! Did you see the picture my youngest did under post, “The $hit my kid says is funnier that the $hit your dad says.” I almost fell over from that one too! I think being a teacher would be fun, (only when the kids turned in drawings ;). I am cracking up at this! I can just see one of my two dudes turning this in for a project. Lol! Boys right?! Totally how they are wired. Oh gosh, I don’t know how you ever keep a straight face–for the occasional discipline or teaching moments… and honestly, kcerise’s comment is equally hilarious!!! God bless y’all today! I don’t keep a straight face! I laugh. I shake my head. My job is to show them what a normal reaction to their antics would be. ha ha! Besides, I am way to easy to laugh even when no one else finds something funny. Funny! The reminder to “Treat that thing with respect, it needs to last you a lifetime” is often heard in our house. Oh, this is a story and a picture from a few years ago. I just had never shared. I am pretty sure he was in third grade. I was standing in the driveway talking to a painter and he handed it to me as he got off the bus. I completely lost it laughing! He said his teacher pointed at it and said, “There is no bone there.” and laughed. My seven year old would be all over this too. If you look at my post, “The $hit my kid says…” you will see a picture Peter drew recently of an Austin Powers scene! I almost killed my husband for letting him watch portions of the movie.